The alleged attacker was an Australian man who professed to hate Muslims, immigrants and people of color. A man who, in his online screed, said he saw President Trump as a symbol of his white nationalist ideology. So, in this moment, when many Muslims say they feel alone, their faith demonized in some cases by elected officials including the president, other faith groups are stepping in to condemn the hate that drove the killings and show solidarity. In Cleveland, Rev. Joseph Hilinski, a Catholic priest, spoke out with other faith leaders and elected officials on the steps of city hall. "We've all experienced the evil of hate. we pray that we'll be strong together and all of us will work together to remove all of that hate," he said. The speakers ignored the man across the street blasting patriotic music as he towed a trailer decorated with the slogan,"Trump: Build The Wall." These gestures of solidarity are more than just about giving comfort. "The common thread that connects these tragedies, such as the Pittsburgh [synagogue] shooting on October 27th and the Christchurch shooting, is a hateful, destructive, violent white nationalist ideology that targets all of us," said Ginna Green of Bend the Arc, a progressive Jewish advocacy group. "In this moment we are not safe unless we are together." This attack is one of an unfortunate trend, a symptom of a wider problem that's been playing out for years now. There was the slaying of nine people praying at the Emanuel African Methodist Church in Charleston, S.C., in 2015; the killing of 11 Jewish people at the Tree of Life Synagogue in Pittsburgh in 2018; two foiled attacks against a Muslim community in upstate New York — one in 2015, the other earlier this year; the bombing of a mosque in Bloomington, Minn., in 2017. Our strength, our resilience and in many ways even our survival depends on those types of alliances in this country and beyond. Alliances with other faith groups and communities that know the history and danger of bigotry are a vital part of the defense against extremist groups driven by white supremacy, said Rami Nashashibi, a Muslim community organizer on the south side of Chicago. "Both the physical and spiritual well-being of our communities here and in the future really depend on how well we are connected to one another." Nashashibi said. He heads the Inner-City Muslim Action Network. "Our isolation, our disconnection from one another only makes us that much more vulnerable to the forces of evil," he says. "To the forces of hatred and bigotry that either want to silence us, intimidate us or pit us against one another to carry out really insidious agendas." Some of the first messages of solidarity Nashashibi received after the New Zealand attacks were from Rabbi Robert Marx, who marched with Martin Luther King in Chicago, and Reverend Otis Moss III, who leads the largely African-American Trinity United Church of Christ in Chicago. "Having those type of voices, that are not just articulating messages of solidarity in one current moment, but come out of a long context of struggling with black and brown communities against all forms of white supremacy, hatred and bigotry, xenophobia and racism means a tremendous amount to me personally and I think to a lot of the communities," Nashashibi said. "Our strength, our resilience and in many ways even our survival depends on those types of alliances in this country and beyond." Other faith and community groups put out messages of support. The Evangelical Lutheran Church in America urged people "to reach out to your Muslim neighbors today and in the days to come to ask how you might offer solidarity and support." The president of American Atheists, Nick Fish, asked people to start the fight against bigotry "with examining our own words and actions to ensure that we are not contributing to a climate where these attacks are even conceivable." The Human Rights Campaign, an LGBTQ civil rights group, called on President Trump to stop "fear-mongering." 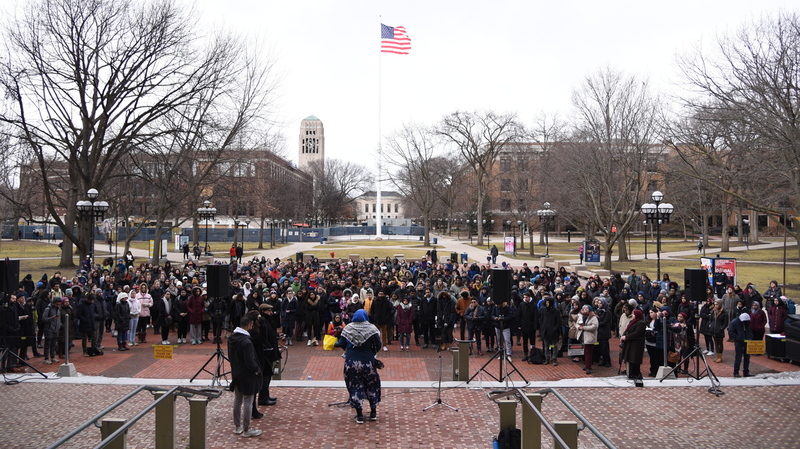 At the University of Michigan in Ann Arbor, an interfaith vigil of more than 200 people gathered Saturday. Elected officials, rabbis, pastors and poets were among those who mourned the killings in New Zealand. But even that was interrupted by fears of violence. In the midst of the vigil, there was a report of an active shooter in the area. People fled the vigil, leaving behind shoes and backpacks. 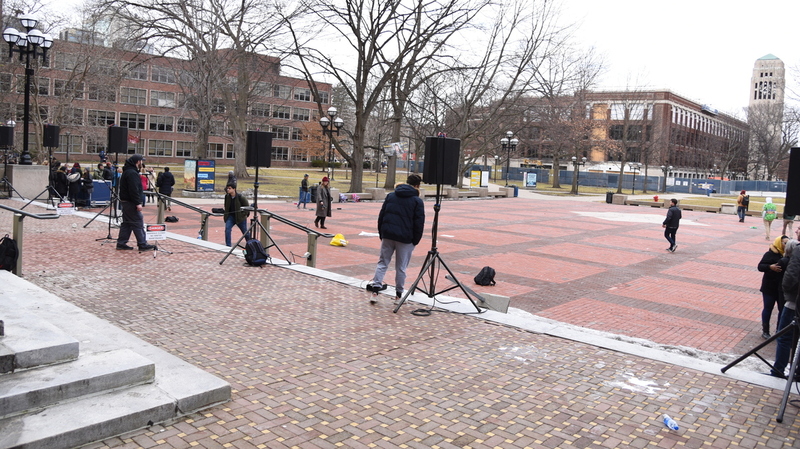 After reports of an active shooter on campus, an interfaith vigil in support of the Muslim community was interrupted, and participants scattered. The reports turned out to be a false alarm. It turned out to be a false alarm — but the fear was real. Mina Arshad attended the vigil with her sister who's a student at the university. She hoped to find people coming together. Instead she briefly lost her sister in the chaos. Reunited, they hugged and cried. "Are you ok? I was so worried about you," Arshad told her sister. She said, she thought someone might have come to the vigil to kill more people, maybe more Muslims like her. She is visibly Muslim, wearing the religious head covering. "The fact that people still seem to think that because I wear a freakin' piece of cloth that I'm somehow a terrorist that's pathetic," she said. Her voice trembled. "What happened in New Zealand that was terrorism. The fact that I had to worry about my sister because she was on campus and she's brown. That is pathetic. People need to grow up." Her anger, she says, is from her fear that at any moment hate will turn to violence. Even when the community came together to find comfort, they feared another attack was underway. Razi Jafri of Michigan Public Radio contributed to this report.